Raising my children to know and love the Lord Jesus Christ is first priority in our home. While I don't shove the Bible down their throats, I do want them to get daily Biblical instruction. Ultimately I want them to have a heart for the Lord so they can live their lives to their fullest potential. Although this blog post is about teaching the historical accounts recorded in the Bible, they will learn to love God because of the truth they see in my husband and I. I will save that topic for another day! My purpose in this post is to hand new moms or new Christians with just a few resources to help them teach their little ones about Jesus at home. It isn't an easy job. It takes time, effort, and money. But here is how I teach it simply and frugally. I am new at this myself, so please comment with any tips you have to new moms! 1) Every day after our morning routine (breakfast, clothes, hygiene) we gather in our living room to start our school day. Daddy is already at work by this point, so I do the instruction here. I pray, and then pull out their Bible verse binder. Inside of the binder are baseball card protectors. I purchased them from Walmart for a few dollars- well worth the investment. And inside of the protectors are the ABC Bible verses my children (2 and 5) have memorized. On the first day of school I began teaching the "A" verse ("all have sinned and come short of the glory of God" Romans 3:23). After the boys memorized it (a week later), I let them place it in the very first spot. To avoid fighting, I let the one who knew the Bible verse the best add the card to the slot. Then, I took out the card and handed it to his brother. He got to put it in the slot. We have had NO fighting at all with this method. You think my 5-yr old outshines his brother every time? Not so! My 2-yr old thinks mathematically. He knows the Bible verse references better than anyone in our family! 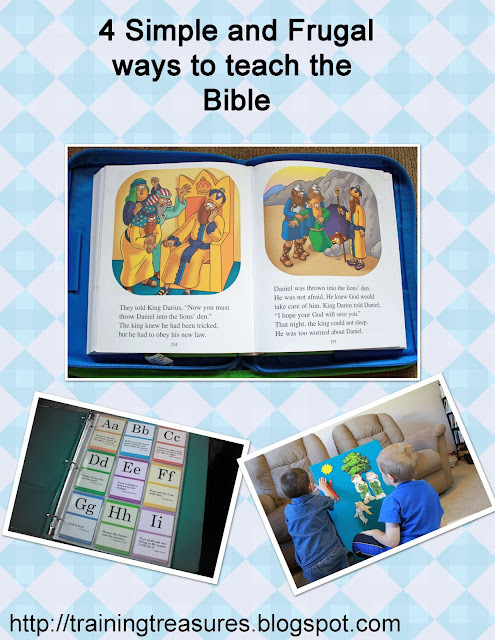 I bought these wonderful ABC Bible verse cards with my son's K5 Abeka curriculum. They are a little bit too wide to fit in the baseball card slots. But no problem- each card has a border around it. I trimmed them on the left and right sides to make them fit perfectly! They were $3 or so- so inexpensive that I'd rather buy a whole new set than laminate them. I am thinking about making a free set similar to these, if they would be a help to you (comment below if you would like to see something like that!). 2) After prayer and Bible verses, it is story time! This is where teaching the Bible gets fun (or not). Our favorite way to learn our Bible stories is by using the felt board. A felt board is so easy to make. Grab a piece of scrap wood, wrap some felt around it, and hot glue the edges. Voila! The Bible story pieces can be very pricey, about $20 per story set! I purchased a set on Amazon for $20- but it included several stories and a lesson plan book! Sadly, I can't seem to find it on there anymore! The pieces were uncut, which is why they were so inexpensive. Or, you can find coloring pages of Bible characters (online or in books). Color the pictures, laminate, and then hot glue a scrap piece of felt to the back. In the above picture I'm using this method (Adam and Eve) combined with factory-made characters. The kids don't always listen to Bible stories very well, but they absolutely love to listen when they know they get to help put those figures up! 3) I found this great website one morning when it was time to teach a Bible story that I didn't have any visuals for. The site is called Bible for Children. They have the Bible stories laid out like a children's Bible. You click on the story you like, and read to the kids. The stories are longer and more detailed than a children's Bible, which I love. The images do look a little wonky sometimes, but the kids don't care. Since I teach Bible on the living room floor, the computer is easy access for us. 4) And of course, if you are short on time, knowledge, or just want some variety- you can always rely on a good old fashioned Children's Bible. The stories are only a page or two, and many, many stories and details are left out, but they do hit the main topics . . . usually. I have found many Children's Bibles at the thrift store, but this particular one came from Sam's Club. It was the first one that appealed to me after searching high and low! It is called The Beginner's Bible, and they have it on Amazon as well. The one I bought from Sam's came with the blue and green cover. And those are the four main ways I teach the Bible to my kindergartners. We do listen to Bible songs throughout the day (we love Veggie Tales), and we also make Bible crafts from time to time. But the above 4 ways are done on a daily basis. God bless!